With each hit a delicious and refreshing glass of pink lemonade will send your taste buds straight to euphoria while putting out this exhausting summer heat. One Hit Wonder has established a great reputation for crafting premium eliquids at an amazing price and Fire Man is no exception. Expect a crisp and tasty flavor that will suit any fruit lovers vaping needs. Upon inhale a rush of pink lemonade will swarm your palate and tickle your tongue. Sour and tangy notes of freshly squeezed lemons will provide a fun kick while the sweet lemonade undertones take the backseat. During exhale is where the sugary and sweet pink lemonade will emerge and take over while the sour notes fade away. 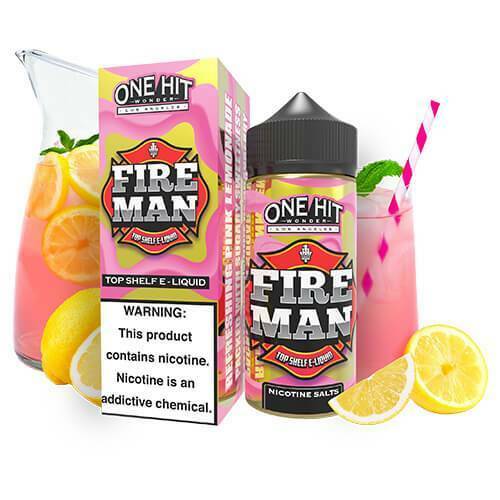 One puff of Fire Man and you will be convinced that this flavor is a perfect candidate to become a huge summer hit.